This post is a travel guide about the best places to visit in Gokarna. Gokarna might be a sleepy little temple town in Karnataka, but is well worth a visit. It has no less than five picture perfect palm fringed beaches and it is an important spiritual pilgrimage center for Hindus. In my opinion Gokarna has some of the best beaches in India. Forget about Goa. If you want a quiet paradise to recover from India’s intense chaos come to Gokarna instead. Gokarna is not yet that touristic and is a peaceful and quiet place. Even though the main places to visit in Gokarna are its beaches there are other things to do as well. The rocky coastline offers nice hiking opportunities and there are several important temples. 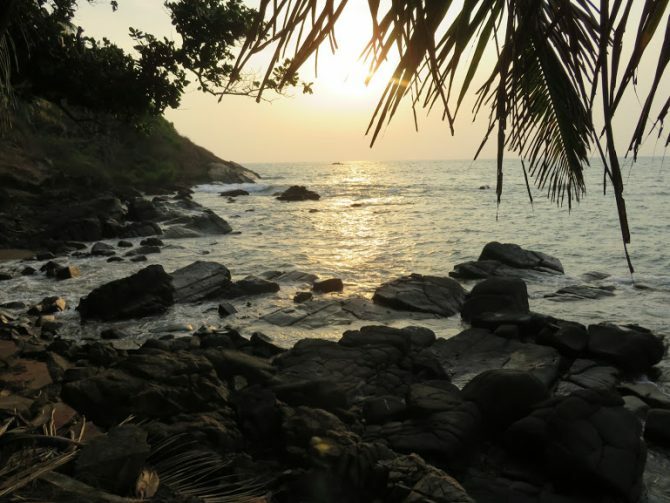 Gokarna has something for everyone whether you just want to relax and do nothing or want something more adventurous. Before I went to Gokarna I didn’t know much about the different places to visit in Gokarna. There are several beaches, some so remote that they can only be accessed by boat or hiking over the rocky cliffs. Others are close to the city and crowded with religious pilgrims. So what are the best places to visit in Gokarna and where is the best beach in Gokarna? Of course this all depends on what you are looking for. For me, it was a peaceful and quiet place, and Gokarna delivers without doubt. But if you are more adventurous or looking for spirituality, Gokarna has a place for you too. The main beach is the most important place to visit in Gokarna. Not because of its beauty, but because all pilgrims visiting the mahabeleshwar temple have to take a dip in the ocean at the main beach. Along with the pilgrims and temple ceremonies, that are interesting to watch, also comes the problem of garbage. This makes the main beach not one of the most idyllic places to visit in Gokarna. Kudlee beach was the best place to visit in Gokarna for accomodation options. It had the right mix of a scenic long stretch of sand that is far enough from everything to feel remote, but easy to acces and with a decent choice of restaurants and guesthouses. Logistics: the beach has a north and south entrance. The north entrance is a 30 minute walk from Gokarna town. The south entrance to the beach is a long tuk tuk drive over winding roads. Om beach is the most popular place to visit in Gokarna because of its om shaped appearance. Climbing one of the hills or rocky outcrops will clearly show you the om symbol that this beach is famous for. You will not be the only person around and it can get pretty crowded during the day. It’s easy to escape the crowds though as the beach is long enough to walk to some quiet corners at the end. That makes this the best beach in Gokarna for those that love a beautiful palm fringed beach with enough facilities around. Logistics: It is a 6 kilometer drive from town over winding roads with splendid views over the ocean. Alternatively, its a short hike from Kudlee beach over the rocky cliff. The further south you go, the more secluded the beaches get. Half moon beach is no longer connected by road, but requires a scenic hike or a short boat ride from om beach. There are basic beach huts and restaurants in the tourist season from november till february. In my opinion this is the best place to visit in Gokarna for those that love solitude, because you will have the beach all to yourself. The only people that come here are those that have finished the Gokarna beach trail or those that come by boat. There is absolutely nothing but sand and palm trees. It’s not for nothing that this beach is called paradise beach. There are no facilities so bring along everything you need. Gokarna is a small town, but of great significance for Indians and a place of pilgrimage for many Hindus. The temples in town are interesting to visit and will give you an insight into religious life. The Maha Ganpati temple dedicated to Ganesh draws most of the pilgrims, even though the Mahabaleshwara temple is older with a 1500 year old statue of lord Shiva. Other temples are the Bhadrakali temple and the Mahalassa temple. Gokarna town has a small market with fresh fruits and vegetables. It is also a great place to buy souvenirs and has some nice local places to eat. If you love hiking you should consider the Gokarna beach trek. Also known as the Golden Trail. It is a moderate 8 kilometer trek connecting Gokarna’s beaches with each other. From Kudlee beach all the way to Paradise beach. Most of the trek is along the shore of the Arabian sea with beautiful views on the ocean. There are also rocky and hilly stretches that requires a bit of climbing, but nothing too difficult. Wear some sturdy sandals that can get wet and enjoy. I think the best place to visit in Gokarna for accomodation options is Kudlee beach. It is tranquil, but still easy to reach and with enough facilities. It is also within walking distance from Om beach where you can take boats to the more remote places to visit in Gokarna. I stayed in Uma garden tucked away in a quiet corner of Kudlee beach with huts overlooking the ocean. The huts are basic, but it is one of the cheapest options around and the location is great. There is also the Zostel hostel near Gokarna town on the cliff overlooking Gokarna’s main beach and in walking distance from Kudlee beach. Zostel is a popular option and it’s best to make a reservation, especially during the weekends. Unfortunately the culinary scene in Gokarna isn’t as good and varied as in Goa. The restaurants can be a bit hit and miss, depending on the owners mood that day. When I was there the season was already ending and most restaurants at Kudlee beach had a limited menu with food that was uninspiring. The best option that consistently offered good food was namaste café at Om beach, making this beach the best place to visit in Gokarna for restaurant options. The best time to visit Gokarna is from October till March when the weather is pleasant and dry. In April it starts to get increasingly hot and from June till September monsoon season brings rain. In the off season most hotels and restaurants close down. Kudlee beach is the best beach in Gokarna if you visit during that time as there are some facilities that are open year round. Trains at the Konkan railway stop at Gokarna train station and there are frequent bus connections with Goa (4-5 hours), Mangalore (5-6 hours), Bangalore (10-11 hours) and Mysore (11-12 hours). You can check redbus for comfortable night buses from Bangalore or Mysore to Gokarna. We keep skipping India in our travel plans (despite being so tempted time and time again to go) because we always go for the more relaxed options as we know India can be pretty intense. It’s really good to read posts like this to know there are places to escape the madness and unwind. We are heading to Sri Lanka next, but maybe we should bite the bullet and head to India after?! The kingfisher photo is lovely btw!